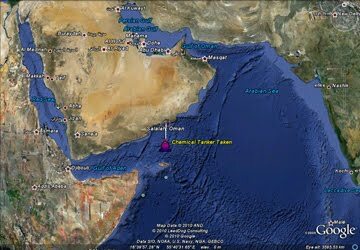 Early this afternoon, 8 May, a Marshal Island flagged, German owned, Chemical tanker the MARIDA MARGUERITE, of 13000 tonnes, was hijacked 120 miles south of Salalah (Oman). The ship was approached by a pirate skiff firing automatic weapons and rocket propelled grenades and the crew reported that they saw the pirates climbing onboard. The ship has a crew of 22 (19 Indian, 1 Ukranian, 2 Bangladeshi) and it is believed that all are well. 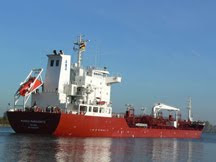 A passing merchant ship tried to make contact by VHF radio but received a response from the bridge of the hijacked vessel to “go away”. EU NAVFOR will continue to monitor the situation. Ship photo by Malte Wulf from Shipspotting.com and used in accord with the terms of that site. Map shows approximate location of attack.